That is the Official List of British Tears and the order in which they must be presented to the TV News crews. Already, the national news here in WaterWorld is skewing slightly to highlight a traditional and typically British attitude: cynicism towards our own government and armed forces. Damp locals huddle in chilly pubs and draw diagrams of Kevin Costner’s boating equipment from memory. If you approach too close to them, they close ranks while one of them swallows the plans. And in this next clip, Prince Charles is seen talking with a selection of pre-selected and security vetted locals. Prince Charles sticks it to Prime Minister David Cameron by openly voicing his doubts on the very matters where David has been pretending all is good. An end to the pause in dredging? Do you now see why we Brits get cynical? So, if I decide one day that I shall not to pay my taxes, when I am dragged in front of the judge months later, I can simply explain to him that I was pausing. I shall now ‘end the pause in my paying taxes’. I am sure the judge will understand. Today, Cameron has announced that he is bringing the Army in to check the flood defences. They (the British Army) will achieve within five weeks what normally takes two years when left to the Environment Agency. They will work at 20.8 times the speed of an expert agency. Why are we Brits so cynical? Have you ever seen the British Army in action? They are remarkably effective at what they excel in which is essentially beating the crap out of non-UK passport holders. You don’t even have to come to them – they are quite happy to visit you in your own country. But the last time a Prime Minister was stupid enough to let them loose among British taxpayers was during the General Strike of 1926. Briefly, in the 1980’s they were ordered to drive ambulances. It went badly. The Army only stopped when patients finally demanded to be driven to hospital instead by a local fourteen year old in a stolen Vauxhall Astra. Survival was more likely than being driven through busy London streets at high speed in a dark green and camouflaged ambulance by an enthusiastic eighteen year old from Manchester. Now Cameron is about to break this rule. And we will now have thousands of well paid soldiers grabbing away the work from the specialist civilian workers in the Environment Agency who are paid much less and are facing redundancy anyway? Oh, well done, Prime Minister! And the Army, who are not in the least bit knowledgeable at a local level of Britains flood water defences will be working at 20.8 times the speed of these Environment Agency specialists who are being swept aside and made redundant? Oh, well done, Prime Minister! What could possibly go wrong…? 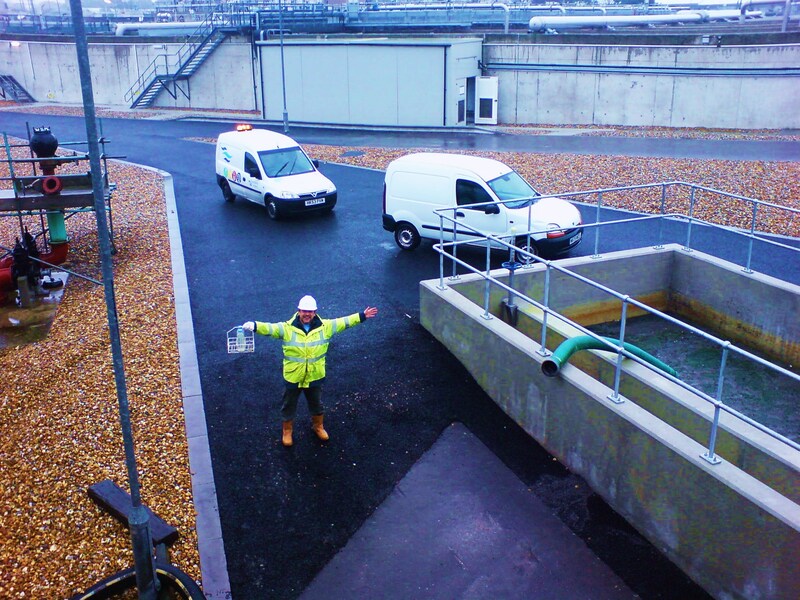 The photo at the beginning of this article shows the author after having been coated from head to toe in raw faeces during a storm on a waste treatment site. I am shown smiling through my tears. (advanced students only). Do you see that brown line around the tank on the right? ← Trolling: Understanding what it is and also why it happens. Thanks! Yes, let’s ALL campaign for an end to the pause in EVERYTHING!